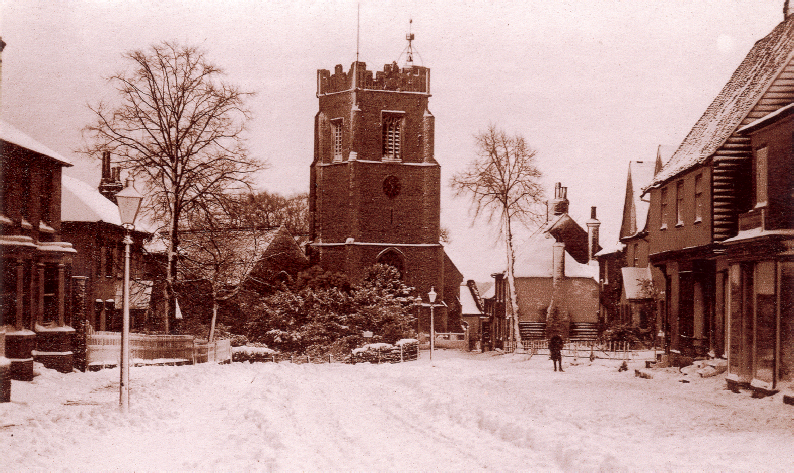 The lower part of the High Street was photographed by Charles Tyler after a heavy snow storm on a winter morning in about 1900. 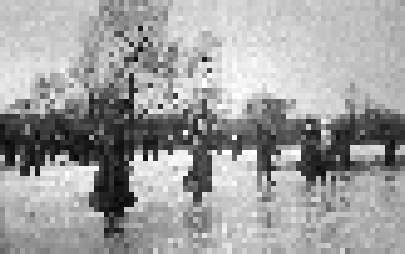 The exhibition is set out in the four seasons of the year, with Winter on this page. To view another season, click on one of the boxes below. 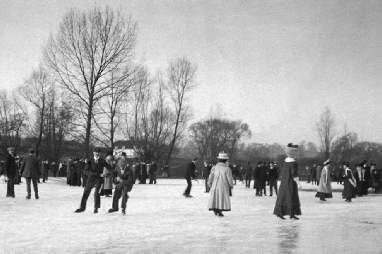 Skating on the meadow beside Stone Bridge was a popular event during the early years of the 20th century. James Barry, the local barber, organised the skating parties by arranging for the meadow to be deliberately flooded with water from Bourne Brook. Then everyone hoped for several days of sharp frost. 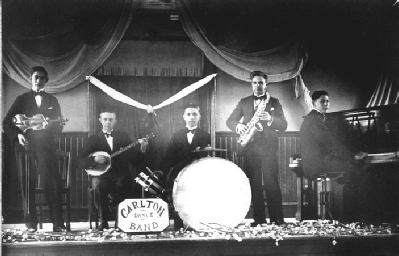 Music for many dances in the Village Hall was provided by the Carlton Band, a group of young men from Earls Colne and Halstead for whom the Band was a profitable hobby. 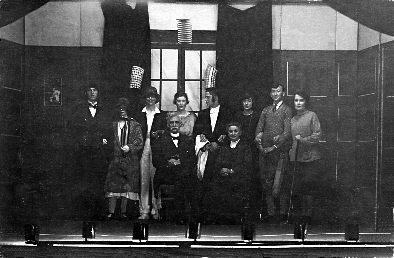 The Village Hall stage was also used by the Colnes’ Amateur Dramatic Society, formed in 1920. This is probably the curtain call for the play ‘Mr Pim Passes By’ presented in December 1921. After Mr H V Greatrex became Headmaster of the Primary School in 1930, plays with large casts were presented in the weeks leading up to Christmas. 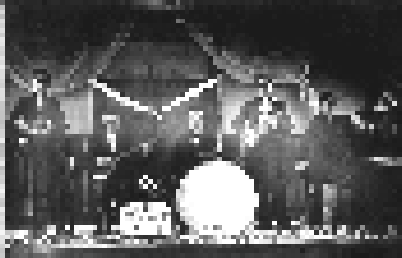 This one called ‘The Magic Key’, was performed in November 1932. Decima Osborne played the part of Titania. The costume which she wore (an evening dress belonging to her aunt) is on display on the museum as part of this exhibition. Another village event in the weeks before Christmas was the Baptist Church Bazaar. Each year’s had a different theme. 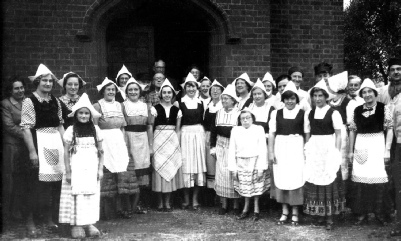 Seen above left, these ladies wore Dutch costumes in the 1954 bazaar. The theme for the 1956 Bazaar was the British Isles, shown above right. Some of the signs were in Welsh. At the beginning of the 20th century, several organisations in Earls Colne had football teams, but the ‘official’ village club was formed in 1874. 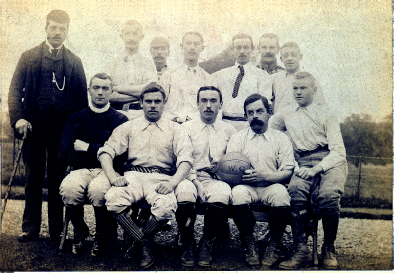 Team members of 1900 are shown above left. 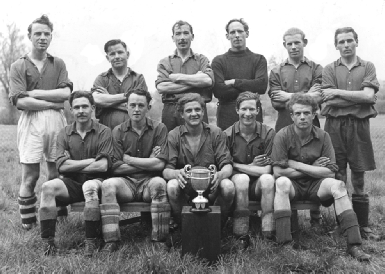 Above right, the members of the 1948 team proudly display the cup which they won as Champions of the Halstead and District League.